Growing up, I remember going on family trips to Paulina (pronounced “pull-line-nah”) Lake with stops to see the Big Obsidian Flow. 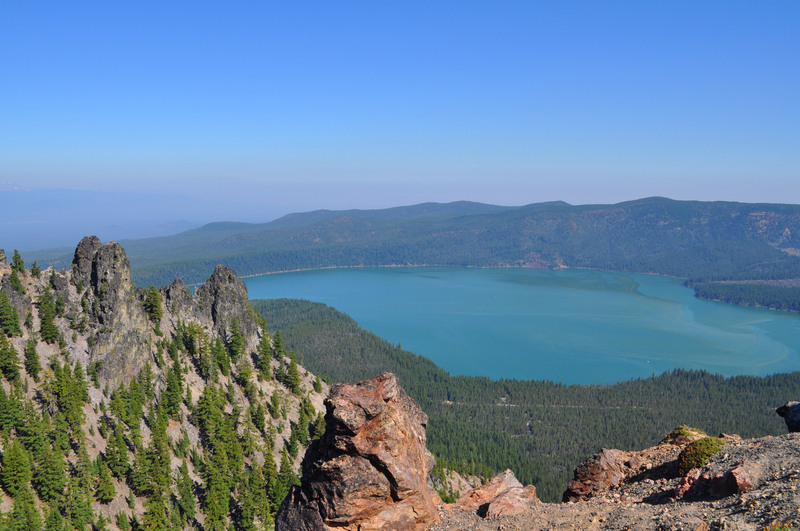 Both were part of what would become the Newberry National Volcanic Monument, which protects more than 50,000 acres of lakes, lava flows, mountains and forested land. One area that we never visited was Paulina Peak. The peak is the highest point in National Monument, and on a clear day, the view is supposed to stretch from Mt. Adams in Washington and Mt. 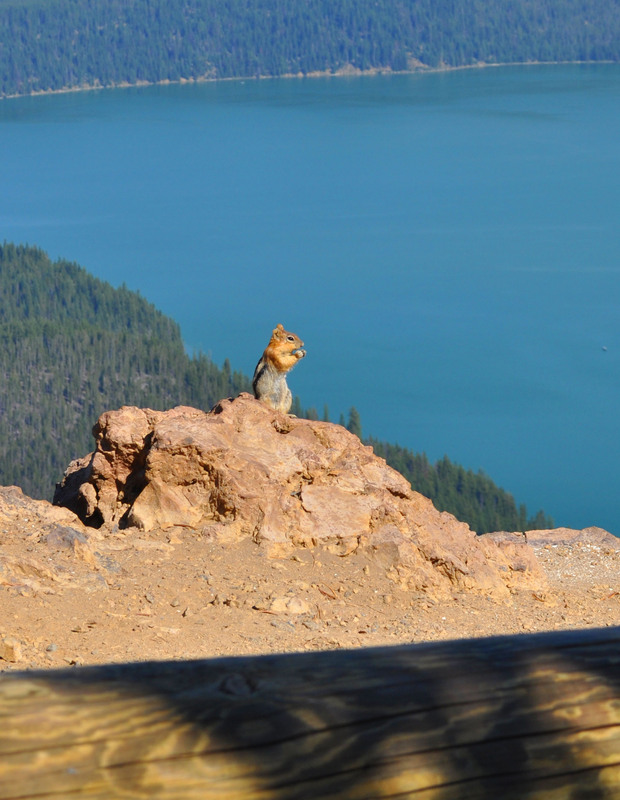 Shasta in California. So, during a recent trip to see an old friend, Susan Berger (yes, Susan, we’ve known each other for 17 years. That makes us old! 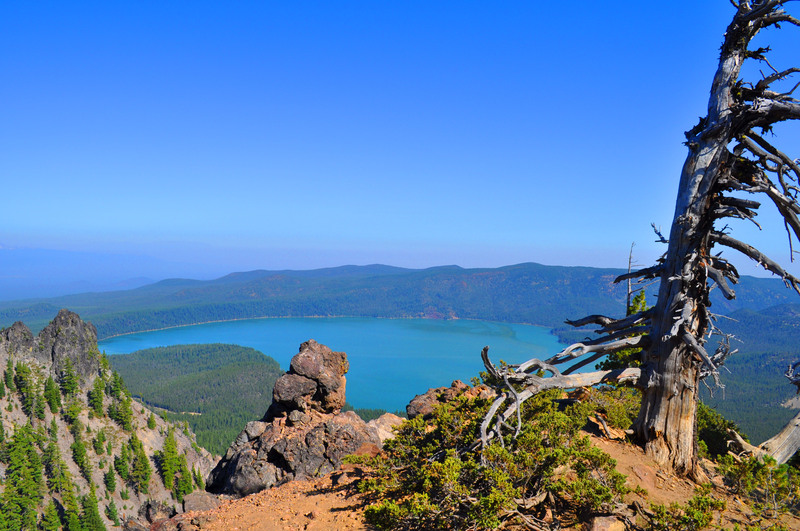 ), and her husband, Torry, in Bend, Oregon, we decided to make the trek to the top of Paulina Peak. Thankfully, Torry drove. Otherwise, I never would have made it to the top. Neither my car nor my nerves would have made it. 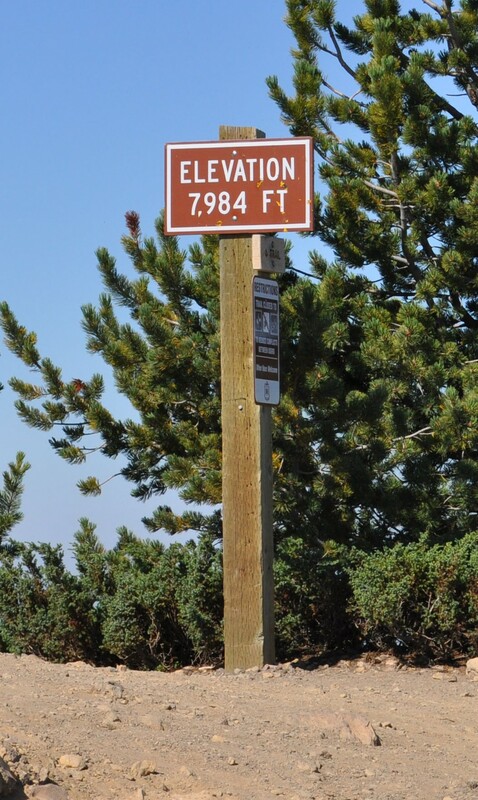 See, the National Monument is maintained by the U.S. Forest Service, and in an effort to preserve the area, the path to the summit is little more than a single-lane, gravel road that winds its way around the peak. On one side of the road is the face of the mountain. On the other is a steep drop-off, and only a thin line of trees that dwindles to almost nothing by the time you make the last turn to the top stands between the road and a deadly tumble to the bottom. At the very top — 7,984 feet above sea level — I slowly peeled my fingernails out of the upholstery and slid out of the car. While the view immediately gave me a touch of vertigo, I realized that the drive was well worth it. Even though the haze created by nearby forest fires kept us from seeing the distant mountains, the view of Paulina and East lakes was nothing short of breathtaking. And reaching the summit gave us the chance to read the U.S. Forest Services’ “creative” description of the geological features of the region. Paulina and East lakes are located within the Newberry Caldera, a massive crater that formed when the volcano erupted and then collapsed on itself. According to the information board, scientists believe that Newberry was not just one volcano, but a “crazy quilt pile” of fault lines and volcanoes that exploded in one epic event about 500,000 years ago. Until that moment, I never realized that “crazy quilt pile” was the term for a geographic feature.